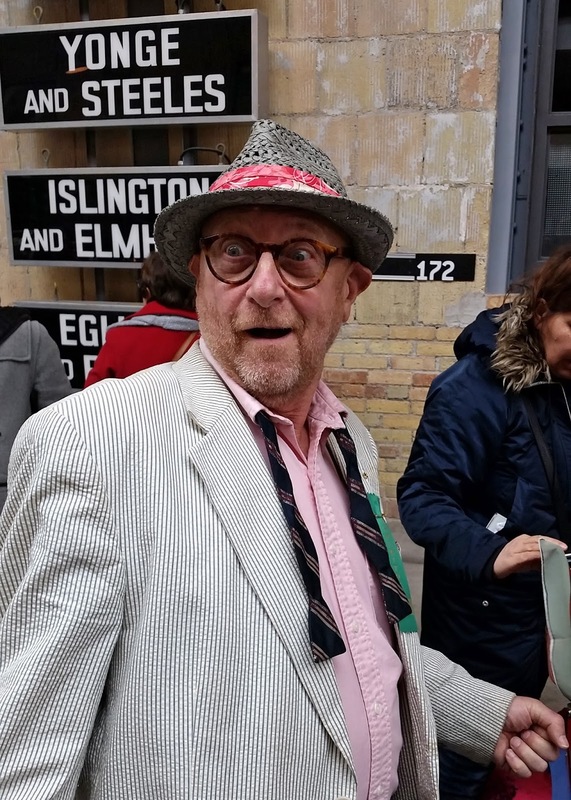 On Sunday, April 10th, I took the Greyhound to Toronto for Gadsden's Toronto Vintage Clothing Show, which has become a rite of Spring for me. The show, which features approximately 30 vendors, is held in the light-filled space of Artscape Wychwood Barns, and can be covered in a couple of hours, which makes it perfect for a day trip. This would be the fourth year in a row that I have attended this show, and I am very grateful to Wendy Gadsden for her support of my blog and always making me feel so welcome when I come to the show. Let's get the important things out of the way first, ie. what did I wear? When you're spending 2 hours each way on a bus, and doing lots of walking in between, comfort is equally as important as style. It was also really cold, which called for layers. 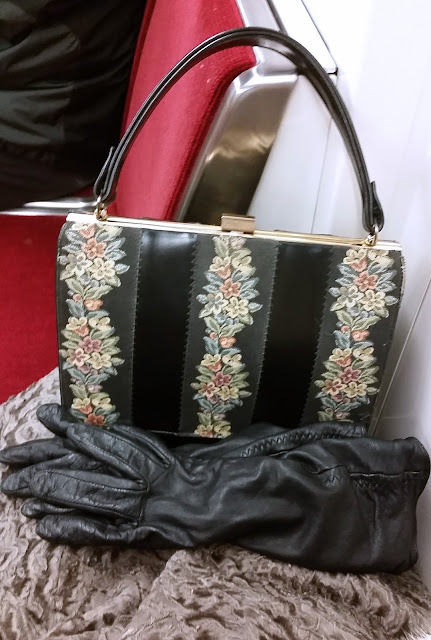 I found this vintage handbag at a neighbourhood thrift store for $1, and thought it deserved a day out as it coordinated beautifully with my grey-green persian lamb coat. I was a little concerned that perhaps the whole package was a bit too "old lady", but I was reassured by a number of the vendors that was not the case. I haven't carried a purse for years (I wear a cross-body bag all the time) so it was strange having to hold it all the time, and I worried I would set it down and forget it somewhere. 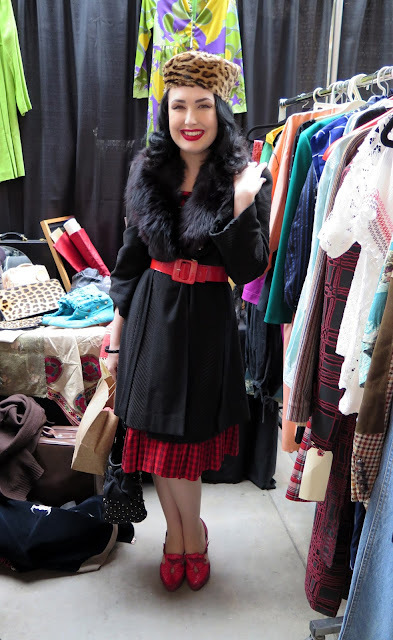 One of the first people I saw at the show was Erica Peck, owner of WILDTHING VINTAGE. I loved her 60's Mod outfit. 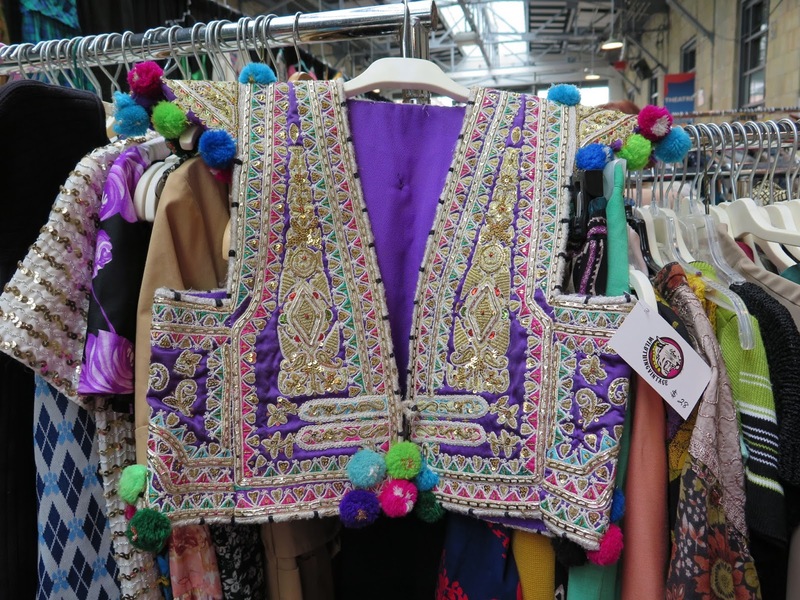 WILDTHING has lots of fun, colourful, and well-priced clothing and accessories. There were lots of pretty spring and summer dresses available, such as the flower print one on the left from Treasure Chicks Vintage. 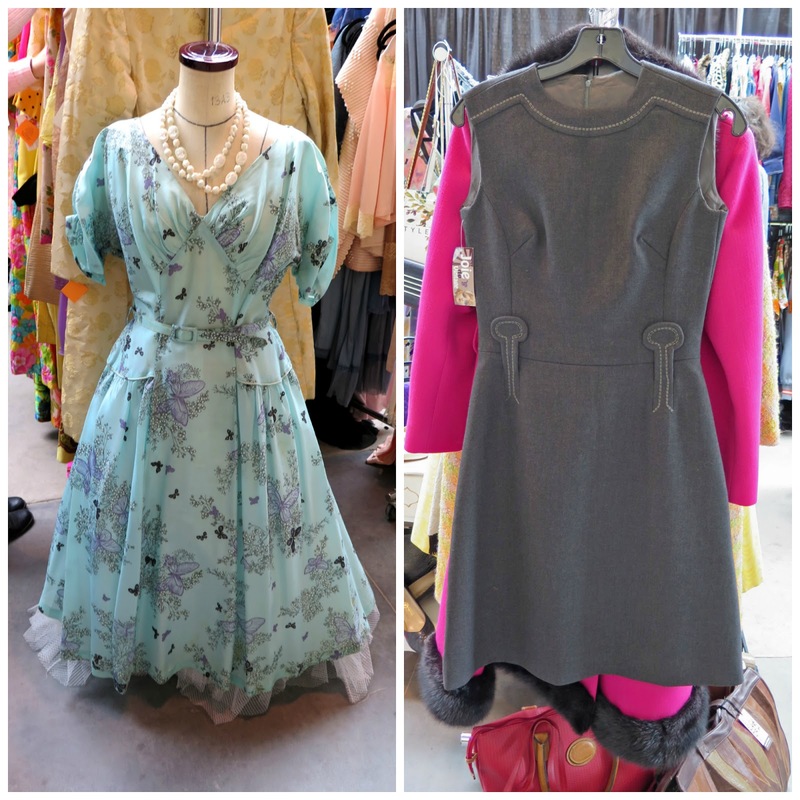 I was drawn to the grey dress with the subtle contrast stitch detail on the right from Joie de Vintage for its chic simplicity. 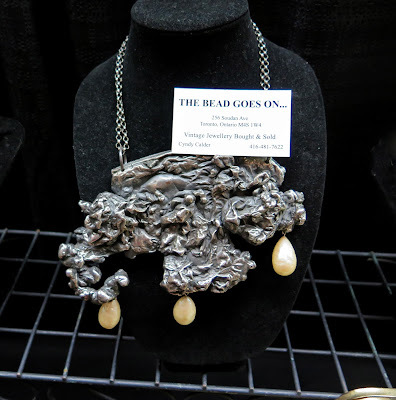 Most of the clothing at the show I like is often too small for me so I tend to focus on the accessories. I loved the large red and black plastic cuffs on display at Renee Piche's booth (left). All but the bottom two on the stand were designed by Jean Marie Poinot. 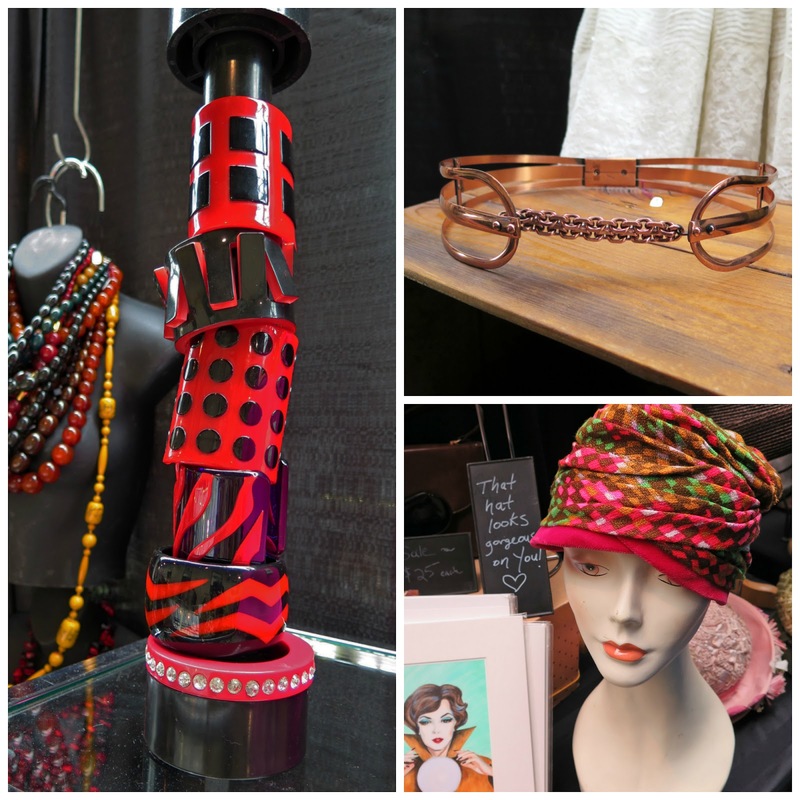 The fabulous copper belt in the upper right photo was at the Dear Hazel May booth, and the colourful hat in the bottom right is from Factory Girl Vintage. This one-of-kind sculptural necklace from The Bead Goes On was made by a German sculptor in the late 1960's. There were some cool accessories for the guys too, like this Renzo Romagnoli "Hemingway" Bar Set covered in Ostrich printed leather from Andrew Zegers Design. The majority of the items at the show are from the periods between the 1950's - 1980's, but there are some vendors who have pieces from earlier decades, like this stunning embroidered cape from the late 1800's at Gadabout Vintage. 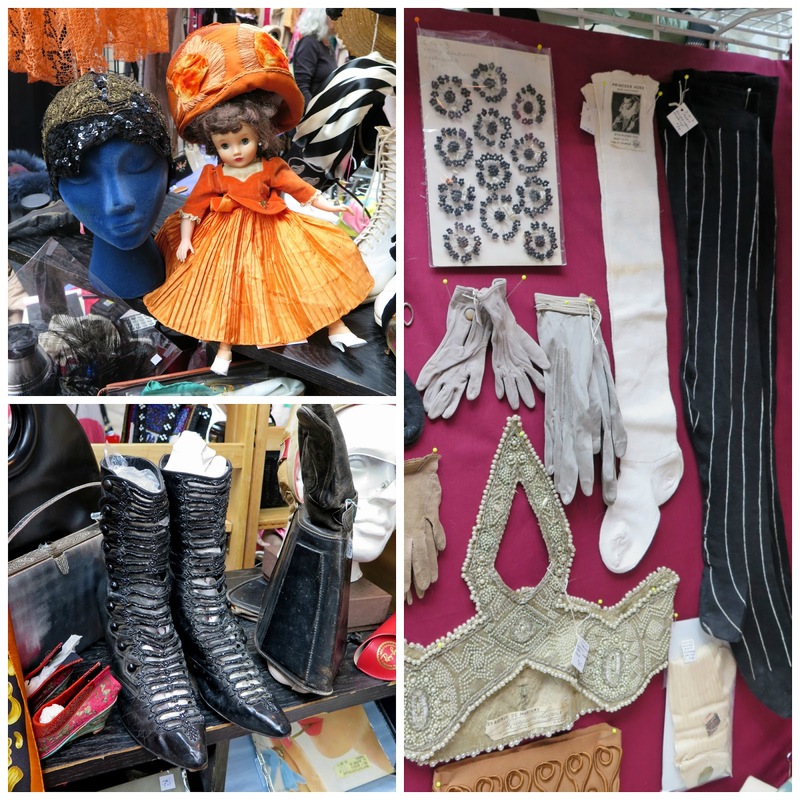 Gadabout also had the 1920's hats (with doll in the top left photo) and multi-buttoned boots (bottom left) that look to be from the late 1800's or early 1900's. 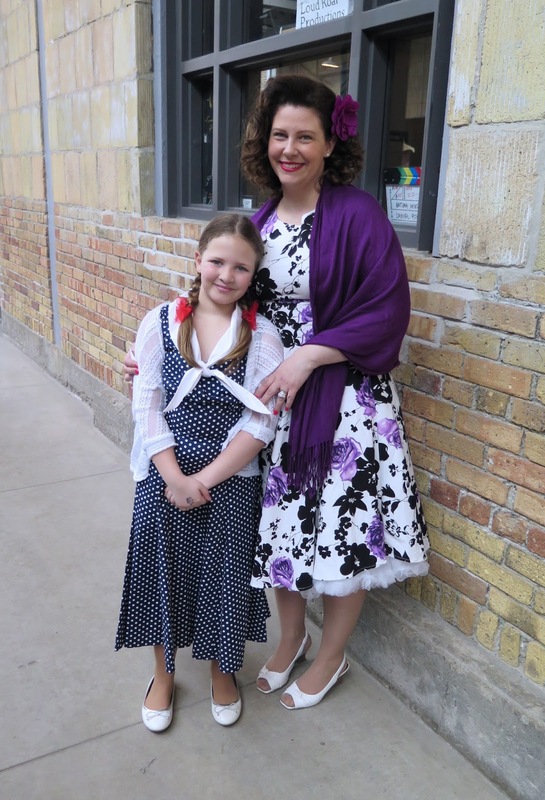 Mother/daughter team Judith Mureika & Julia Wright from Hamilton had hosiery from the 1920's and a package of beautiful beaded appliques from the 1950's. I so enjoy catching up with the very charming and entertaining Yank Azman, who has a booth with his wife Pulver at the show. 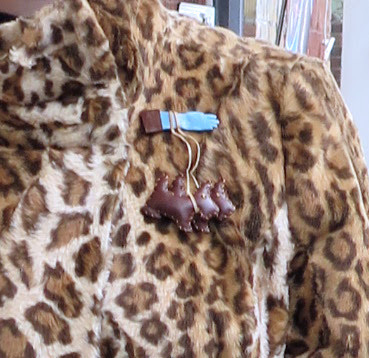 Yank and Pulver had a marvelous collection of handmade leather novelty brooches from the 1930's - 1940's for sale, and even though it's not the style of jewellery I usually wear, I fell in love with this little blue glove holding the leash of two Scottie dogs, and the extremely reasonable price meant it was coming home with me. 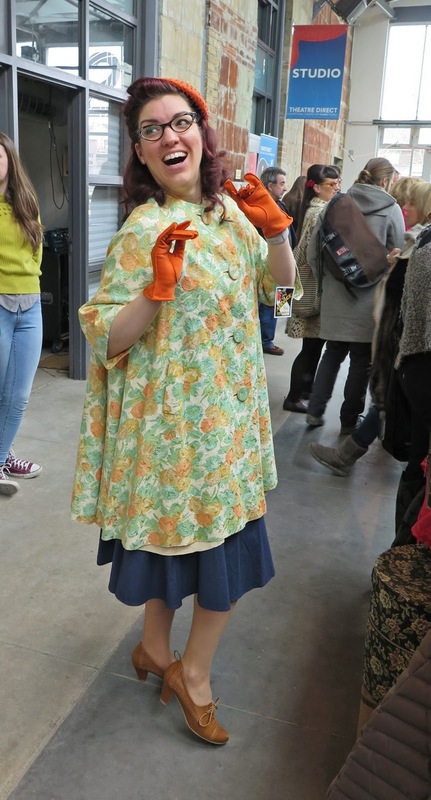 While I was chatting with Yank, we spied this woman trying on the orange and green spring coat and orange hat from Gadabout Vintage, expressing delight at finding the perfect orange gloves at a different booth. 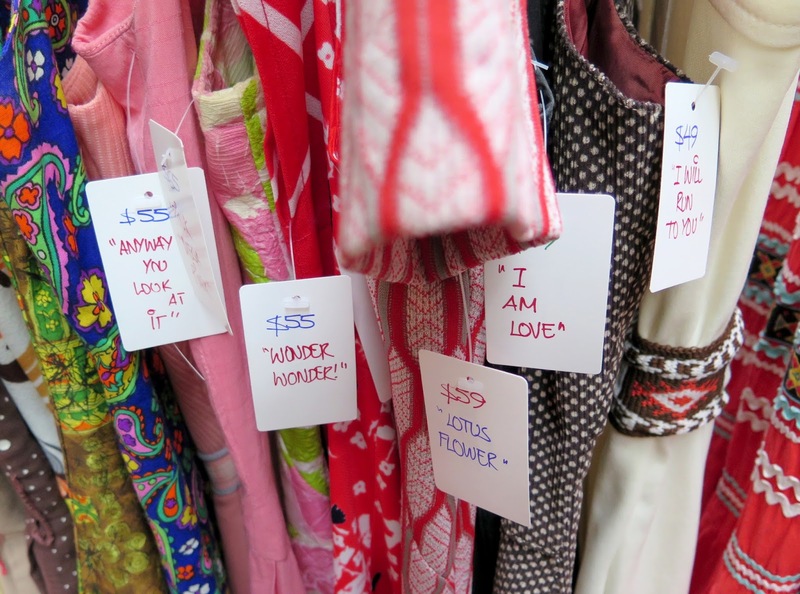 Each of the items at Breathless Vintage had been given a name, which added a note of whimsy. 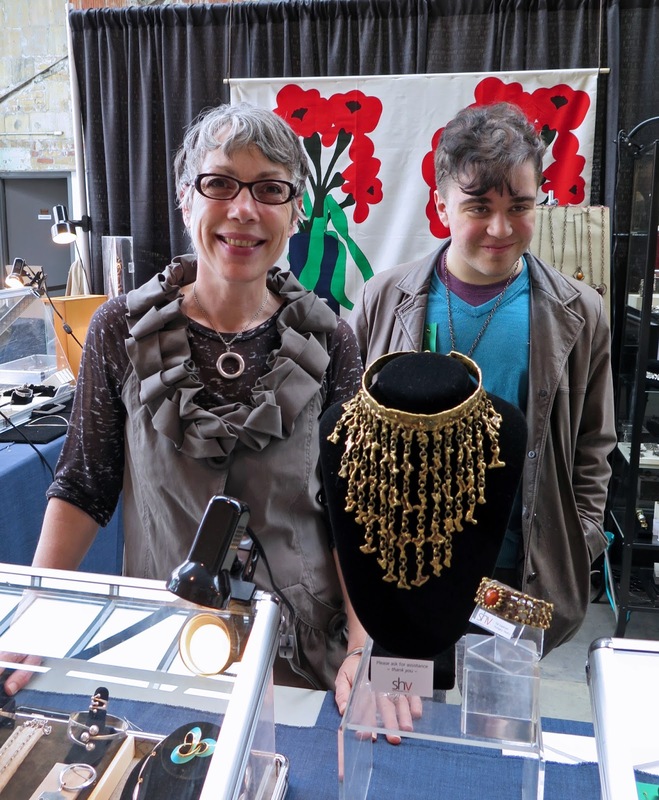 I was so glad to have an opportunity to visit with Samantha Howard (that's her son next to her) at her booth. She carries swoon-worthy pieces of Scandinavian and Canadian Modernist jewellery and it was really nice to find out she was so friendly. 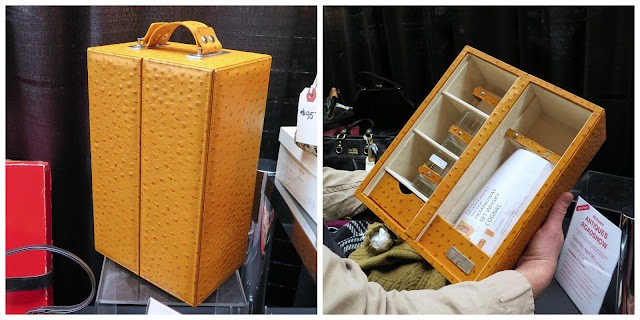 I felt like I had discovered another kindred spirit, which has become a large part of why I go to vintage shows like these. I love spending time with other people who are knowledgeable, and passionate, about clothing and accessories from previous decades. 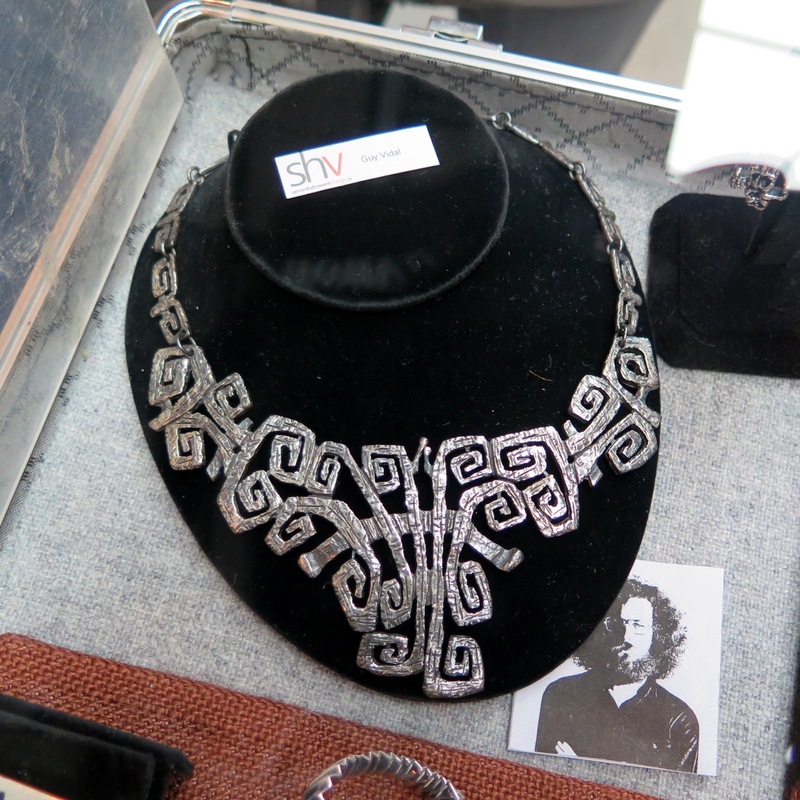 I admired (more like lusted after) this breathtaking Canadian Modernist necklace from brutalist jewellery designer Guy Vidal at Samantha Howard Vintage. I manage to run into this young woman every time I attend this show and it's always a treat to see what she's wearing. How could I not get a closeup shot of her adorable vintage shoes? You can find dates and locations for upcoming vintage and antique shows run by Gadsden Promotions on their website. Wow - there are some beautiful items for sale. I, too, lusted after that necklace. I loved your pictures of all the people. 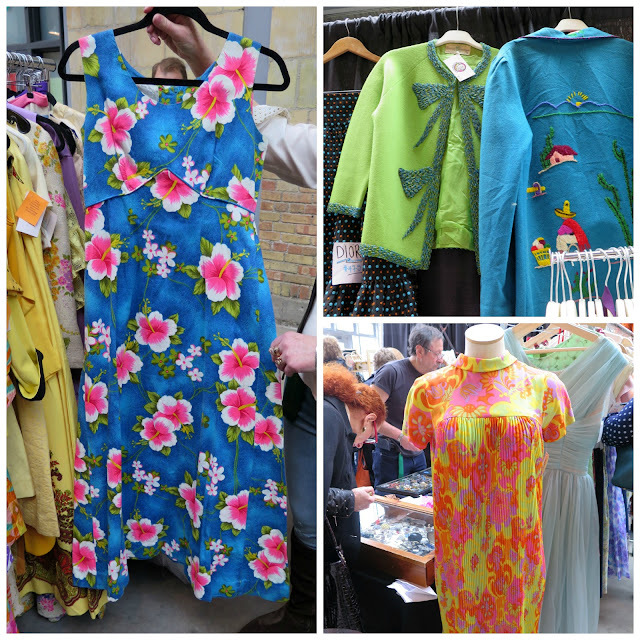 I've not yet attended a vintage fair but I can't wait to go to one - I just have to find one near to me!! Those vintage red shoes are to die for! I gasped out loud at that copper belt - NEED. What a lovely look at the show - thank you, Shelley! WOUUU, lots of fabulousness to enjoy!, I'm loving all the stuff, colorful dresses, fab bijouterie and hats, but what I love the most is the people!, it's always amazing to chat and have fun with people who shares your love for vintage! thanks for sharing! Great review Shelley. So much eye candy here. 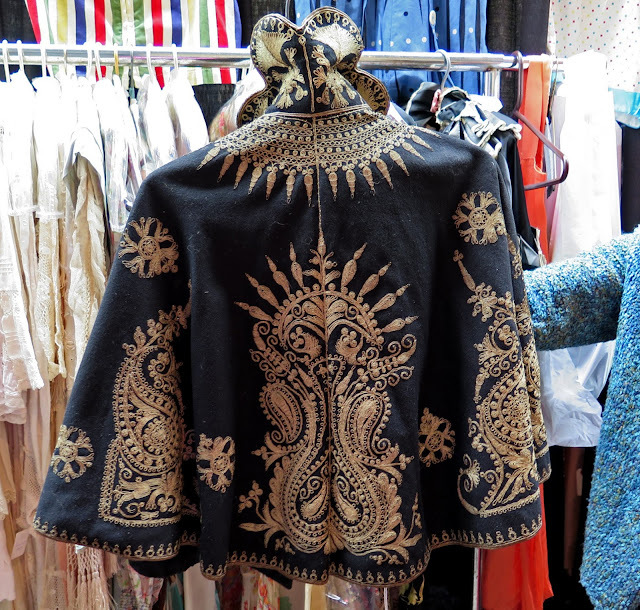 I see a few pieces (hats, gloves, the embroidered cape) that I would have found irresistible. You make friends at all the vintage shows, no matter the location! I always love the vendors and how they get dressed up for these events. Your jacket is SPECTACULAR! Where did you get it? It suits you to a tee. So fun to visit via your photos even though we didn't make it to the show. you look amazing in your jacket. What a ton of beautiful vintage. 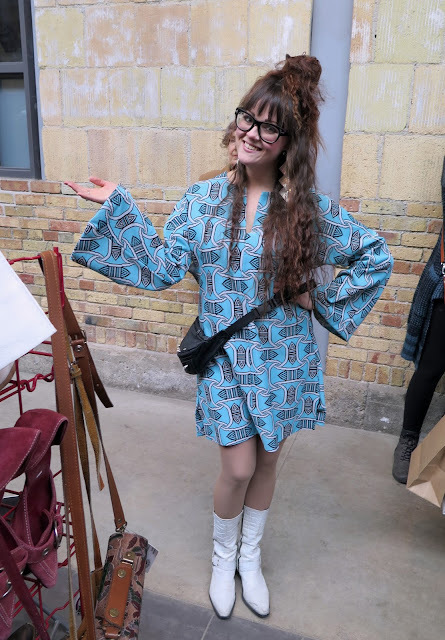 I've just spent the past week sorting and organizing my costume stock, my assistants get a lessen when we do that: I hold up a dress and say "What decade is this from?" So much fun. 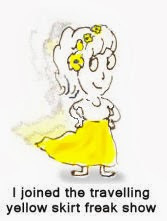 Welcome to my world! isn't it fabulous? How people dress for them, sticking their fingers up at mainstream fashion and trends. Oh I would have loved to go there with you. 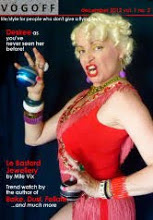 Those red bracelets and the modern vintage jewellery of Samantha. ..I would have been game. Love your little doggie brooch. Very quirky. And you might have been dressing for comfort, but with that coat you will always be perfect. Love the coat. 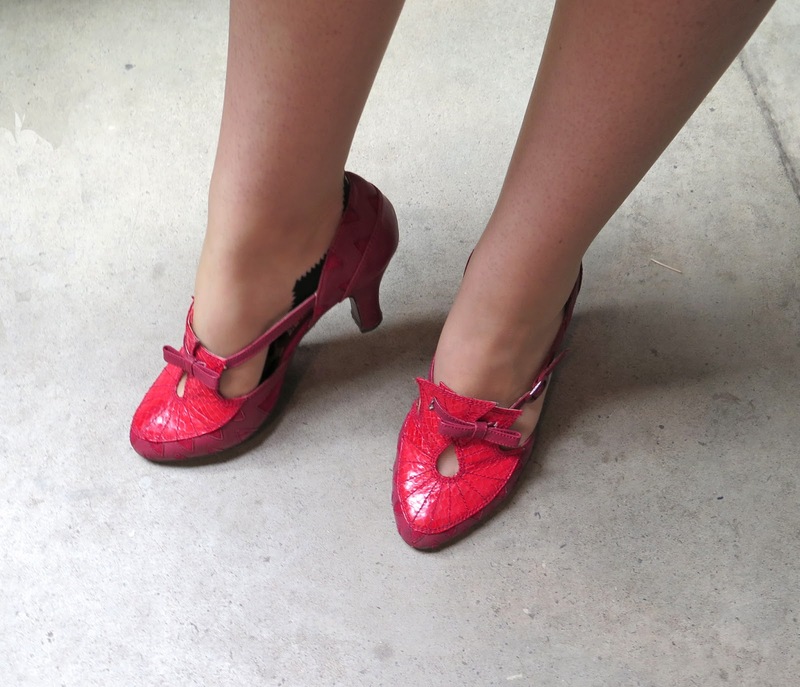 The woman you run into every show (love her shoes) looks a bit like Dita von Teese. 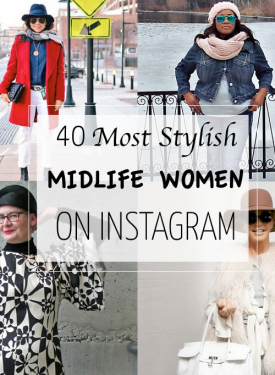 My faves are the great big chunky red bracelets with squares and dots, the ostrich mini-bar (actually, I'm conflicted, but it's so way over the top that it's just about irresistible), and the wonderful red vintage shoes at the end. I wish stuff like that were available in my size. Hey, didn't you say almost the exact same thing at the beginning of your post?